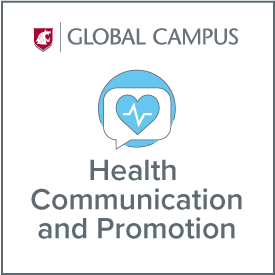 WSU’s master’s degree in Health Communication and Promotion, offered entirely online, is designed for those who work in communication and health sciences and are seeking to refresh and update their professional skills to enhance their careers. This flexible, fully-online program is also ideal for individuals who wish to enter the profession of health communication and promotion by earning trusted credentials from a university noted for excellence in communication studies. Whether you have no training in health communication or are a seasoned professional, this degree will advance and invigorate your career. The program’s multidisciplinary approach offers expertise in new and traditional media while teaching you how to gather and analyze information and use those findings to create health and public awareness campaigns. You will also gain skills in analyzing information and designing health communication strategies, programs, and initiatives and increase their knowledge in communication monitoring, metrics and reporting effectiveness of outreach efforts. The MA in health communication and promotion provides a solid core curriculum, consisting of classes in multimedia content creation, crisis communication, professional ethics, and research methods. In specialized courses in health communication, you will learn health behavior change theories relevant for prevention messaging, message creation and design for effective information distribution, and techniques for effectively communicating health information with specialized populations. Applicants will be evaluated by the Murrow graduate selection committee, which will require official copies of undergraduate transcripts, a cumulative GPA of 3.0 or higher, and a written statement of purpose. GRE scores are NOT required. Note: This degree will not aid in qualifying graduates for doctoral-level programs at WSU or other institutions. If you have questions about the program, please contact Christy Curtis, academic coordinator for the Murrow College, at christine.curtis@wsu.edu or 509-335-5608. Please note: The Online MA Health Communication and Promotion is a terminal professional degree program. It is structured to provide opportunities for those interested in career transition or advancement in professional communication positions. The program is non-thesis, involves limited theory, does not include a classroom teaching component or active research assignment, and therefore should not be considered a preparatory stepping stone to most Ph.D. programs or teaching at a collegiate level.